So, when the dust has settled, how do you repair? Do you brush it under the rug? Do you uncomfortably or reluctantly dip your toes in the water with each other? Or do you make the repair explicit and direct. Repair is a critical part of relationship. If you aren’t good at repairing, your relationship is probably in trouble. Conflict is inevitable, because difference is part of what sparks chemistry. So, relationship pros know that it’s important to clear things up, not let it smolder or fester. And the best way to do that is directly, with care and mutuality. As I’ve seen couples negotiate repair, step into each other’s shoes and acknowledge their part and their partner’s feelings, I’ve noticed that there are two kinds of ‘Sorry’. The differences aren’t glaring, but there are important subtle distinctions that communicate different feelings and intentions. In a nutshell, one is closer to acknowledging how your partner felt and understanding it with care and compassion. The other is more like saying, “Yeah, I screwed up. I let you down/I crossed a line.” Both can include or embody the words and message, “I’m sorry.” But which one is better, or more appropriate, depends on the situation. The first one is kind of like stepping on someone’s toes. It’s inadvertent. There’s no foresight about the hurt. Usually, there is no selfishness or neglect. You’re different, separate people so imperfect attunement and missed wishes, preferences and needs are inevitable. Casually put, ”Shi* happens.” It’s unfortunate, but part of life and totally repairable. Example: You walk by an ice cream shop and you want ice cream. Meanwhile, your partner wants to go home. You think: This will only take a minute. Your partner thinks: He knows I want to go home and he’s ignoring my desires. I feel like he doesn’t care. I feel ignored and hurt, like I don’t matter. Simple example. Maybe you can think of a better one from your own life, in fact. But the point is, you have differing wants and needs. Someone is going to have their needs left unmet. A repair of this kind is about acknowledging that your partner had needs and while you were trying to get your needs met (normal human stuff) your partner didn’t get theirs met. And it’s likely that because you two have some history around this kind of thing, you end up feeling unimportant, hurt and you react. An argument ensues, and you get disconnected. The kind of repair or apology in this case is more about understanding and responding to how the hurt partner felt. Step into their shoes, experience care and share compassion for how they felt. You weren’t wrong, but something happened. Find a place inside that can understand and communicate care from that space. For some couples repeated experiences like this become a stuck spot that requires some deeper exploring and working through, often with the help of a therapist. 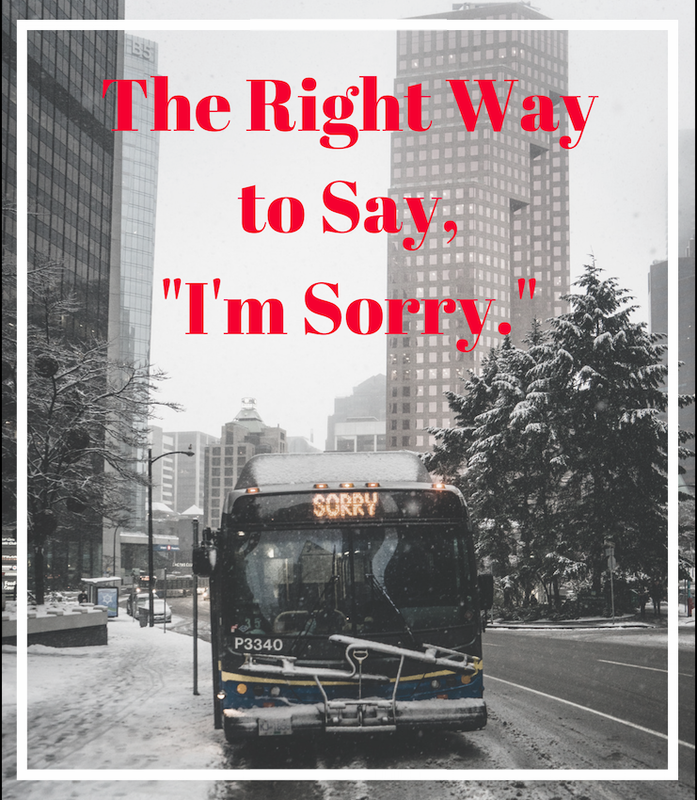 The second kind of ‘Sorry’ is more about taking responsibility for doing something that is an implicitly or explicitly held agreement about values and behaviors in your relationship. Hopefully this kind of repair is needed less. But in some relationships these kinds of “violations” happen more frequently. When they do happen and repair is needed, it’s more like saying, “I screwed up. I see that what I did/said was against our values and hurt you.” It needn’t be a huge aggression. It could be that you were selfish. Or thoughtless. It could be that you were out-and-out hurtful and reacting to some other hurt you felt from them. In any case, the repair is more of an apology and ownership of responsibility and regret or remorse about how what you did or said caused hurt and/or harm. Again, setting aside your experience just for the moment, step into their shoes and tell them how you understand them. Then let them know how their hurt actually impacts you (sadness, disappointment, guilt, pain) and that you care and wish it hadn’t happened. In either case of ‘Sorry’: Curiosity, Openness, Working to Understand/Put Yourself in Their Shoes, Communication of Empathy and Care are key ingredients. If you get stuck along the way, you may need some help learning to repair and/or sorting through more complex relationship dynamics. A good couples counselor or therapist is a great ally and can help you create an even better relationship than before.